‘I wonder if I shall fall right through the earth! Suddenly, this sentence flashed through my mind, while I was exploring the ghostly time tunnels of the Shephelah. This ancient underground world, the depths of mother earth that never end, reminded me of the story I’ve read so many times, ‘Alice’s adventures in Wonderland’. The world that Alice knew as “Wonderland,” is disclosed to actually be named “Underland” in Tim Burton’s film adaption of the book. Many fiction authors have been inspired by mysterious underground worlds. ‘The Underland’ is a location in one of the novels of C.S Lewis, described as a world lying beneath the land of Narnia, where the Earthmen live. And let’s not forget ‘The Underland Chronicles’ by Suzanne Collins which tell the story of a hidden land under New York City. 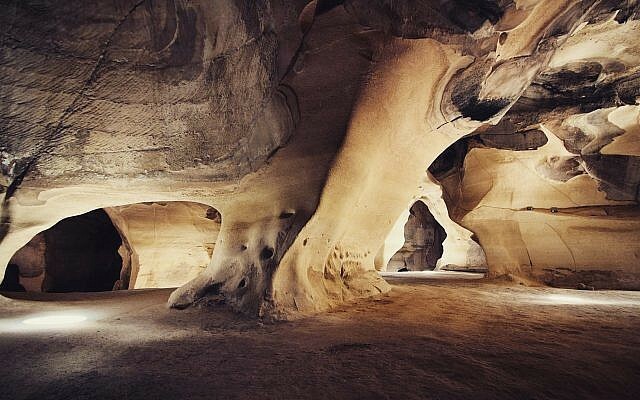 The fertile Judean Lowlands of Israel is home to at least 475 underground complexes and with an estimated number of 973 entrances that lead to a spectacular subterranean network of tunnels, man-made caves and rooms, one can say that it is a genuine Underland. In common with all other areas of the Levant, the Judean Shephelah (meaning “low”, and usually translated as “lowlands”), has been occupied by man since the earliest prehistoric times. The agricultural landscape is strangely impressive and beautiful, and the scenery is well worth looking at, especially the majestic Mountains of Judah rising out of the Judean Plain. The Judean Mountains, approximately 50 km long, were densely forested in antiquity and lions were once prevalent in the Shephelah. The sheepherders must have considered the lion quite a nuisance. Excavations in the southern Shephelah showed that during the Iron Age II period 98 % of all meat came from sheep, goats, and cows. With cows only representing 11 % of the identifiable bones. The low flowing hills are formed of soft limestone, which were shaped and carved over millions of years by streams of water that flow down from the highlands to the Mediterranean Sea. 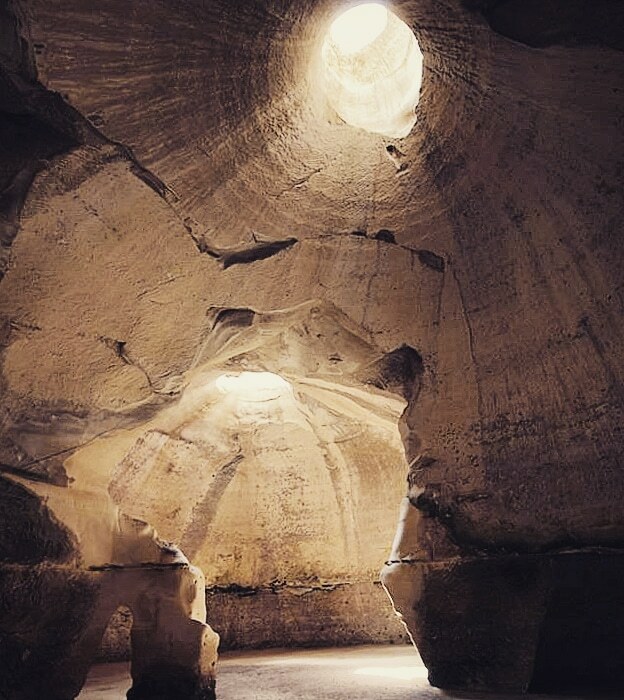 A hard and water-resistant layer of limestone forms a thick crust above the softer chalky limestone which has played an important role in the preservation of this elaborate network of chambers and subterranean structures. 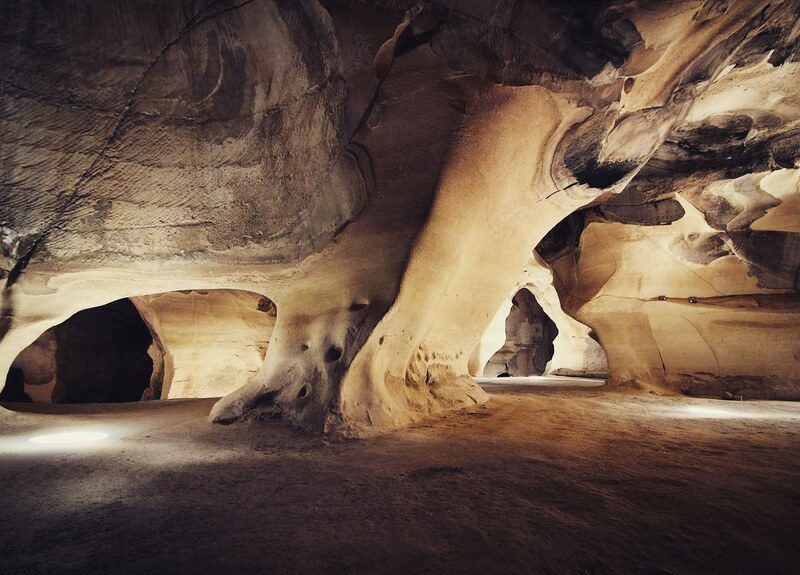 Because of this thick crust, called nari, the underground dwellings are relatively immune to the weathering conditions on the surface. 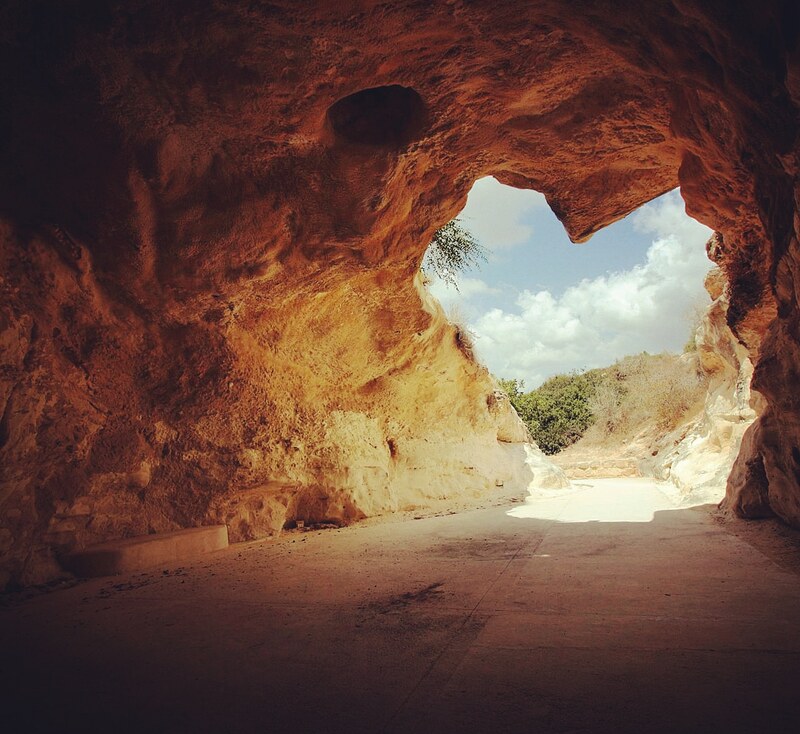 Since ancient times the local inhabitants exploited the limestone to construct their dwellings on the surface and through the millennia, they created artificial caves and bell-shaped cave quarries underneath their feet. First, they made a small opening through the crust to reach the soft chalk layer. As it turned out, the quarries were easily hewn in this soft chalk and by digging vertically, they prevented the roofs from collapsing as the caves were better suited to resisting the pressure from the earth above. 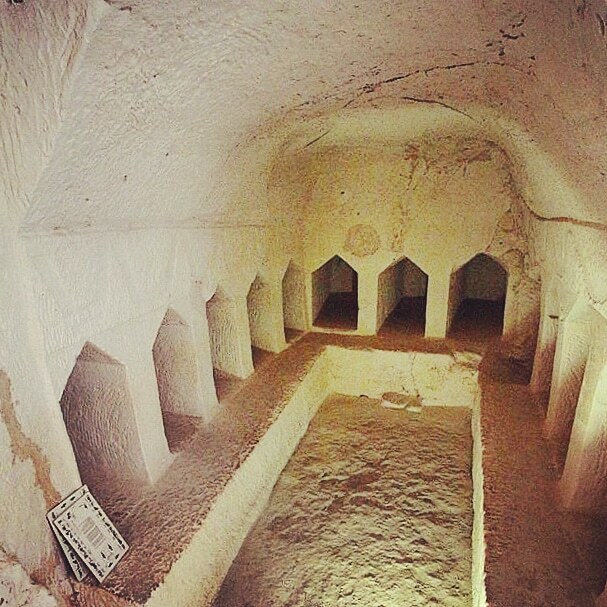 The man-made rooms were then converted in functional rooms such as storerooms, cisterns, stables , workshops for the pressing and storage of olive oil, which was exported to Egypt during the Hellenistic period, grain silos, and columbaria, of which 85 sites have been identified for raising pigeons. 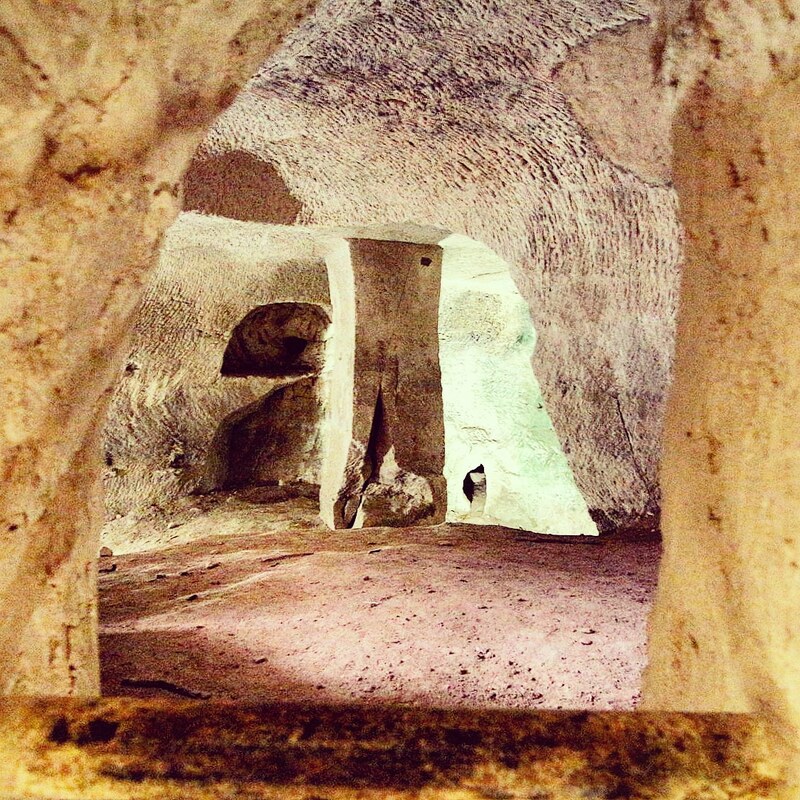 The caves and rooms were also used as hide- outs for people that sought refuge for a longer period. 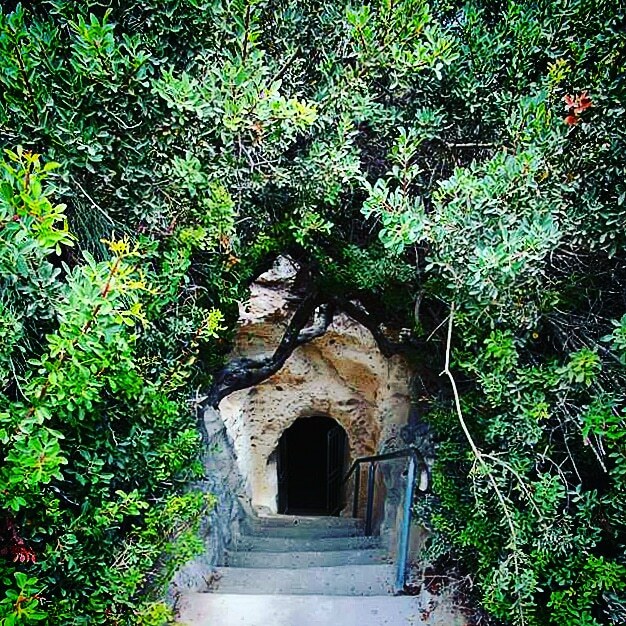 For example, during the Second Jewish Revolt, extra tunnel systems were dug to connect more cave complexes, to create escape routes and better hiding and storage places. Historically this was an area of significant strategic importance and Lower Judea is close to the ancient route linking Mesopotamia to Egypt. The ancient city Maresha was located at the junction of several major roads, close to the main trade route which led from the north to Egypt. 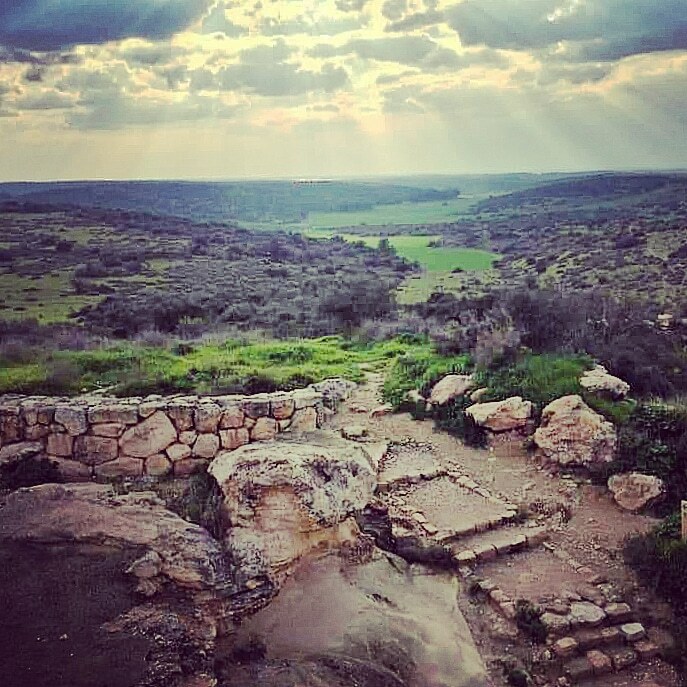 According to 1 Samuel 17, the Valley of Elah was the setting for David’s encounter with the rafah Goliath. David, armed with courage, faith, and a sling stone, wins a victory against the giant equipped with heavy armor and weapons. Goliath is identified as one of the Rephaim, a race of biblical giants who were the descendants of fallen angels and lived among the Canaanite and Philistine peoples. The “Valley of the Giants”(Emek Rephaim) is part of the ancient route connecting the coastal plain with the hills of Judea and leads southwest from Jerusalem to the Valley of David and Goliath. 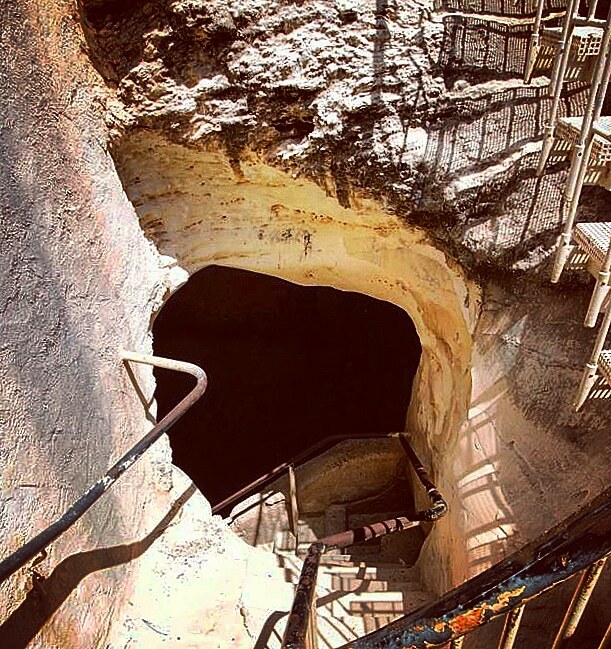 When you approach one of the carved staircases that will lead you into the earth, you first feel a slight draught of air coming from beneath. The air is filled with whispers of the ancient past, biblical tales, king David, fabled giants and the residents of the netherworld. Descending the steep shaft, carefully stepping from one ancient hand cut step to another, you find yourself in a vast underground cavern of astonishing beauty. The Hebrew word Rephaim can also mean ghosts, the prophet Isaiah spoke of Rephaim being stirred in the underworld. It almost seems possible to meet the spirits of long-deceased ancestors when I step further in the dark and walk through these time tunnels. These underground structures are real-time witness to events described in historical and biblical texts. This imaginative underworld teems with magical stories of a life that once was. Touching the walls in the dark, your fingertips feel engravings scratched into the soft chalk, and when you close your eyes and listen to the cave, they are speaking to you from the past, delivering messages. It is so quit that you will hear your own heartbeat mingling with those voices from the past. It is such a captivating thought that through these graffiti we can connect with the ghosts of the Shephelah. Beneath the ruins of biblical Tel Maresha archaeologists have found a unique underground city dating back to at least the eight century BCE. It was the American Edward Robinson who identified Tell Sandahannah as biblical Maresha in 1838. 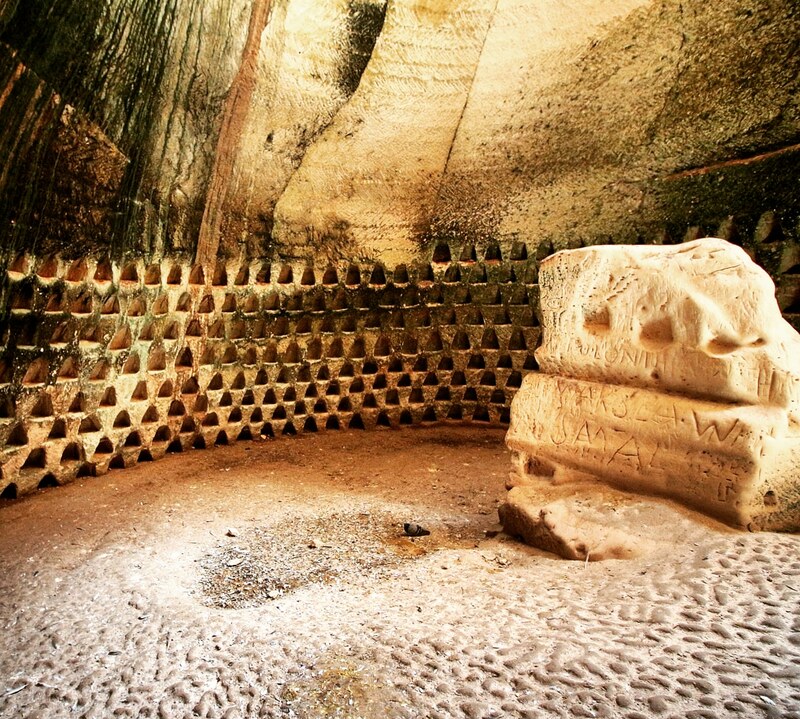 Beit Guvrin, which became Eleutheropolis in 200 CE, developed from the 2nd century BCE onwards, as an urban site, near to, and following from, Maresha. It was on the crossroads for trade and had two aqueducts, public baths, and a theatre. The population was filled by the arrival of a large Jewish community in the third and fourth centuries CE and excavations have found the remains of a synagogue. A large Jewish community existed here during the Roman and Byzantine Periods. 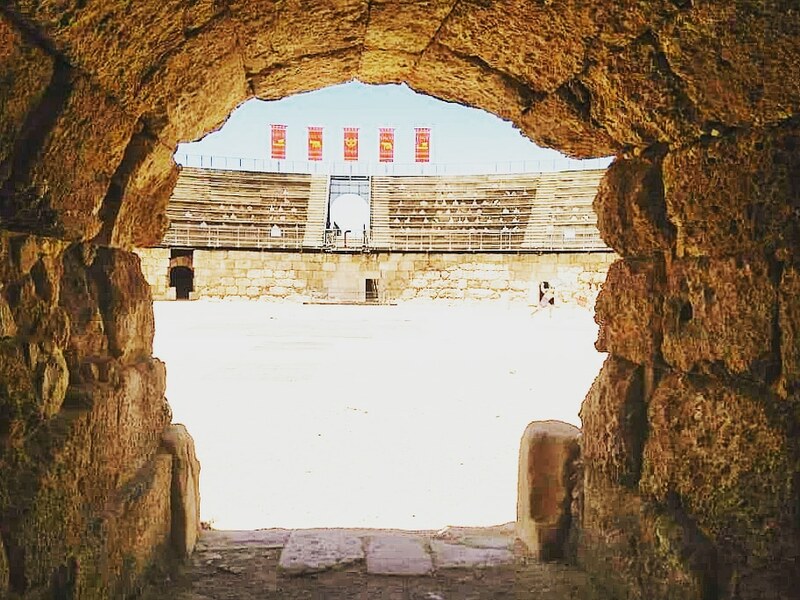 The Roman theatre. Photo Ticia Verveer. During the Roman period, Bet Guvrin was given the status of “city of freemen” and named Eleutheropolis. Its Aramaic name was Beth Gabra, meaning “the house of strong men”, Flavius Josephus called it Betaris, and Ptolemy referred to it as Baitogabra. In the third- fourth century CE Talmud it was known as Beit Gubrin or Guvrin but during the major part of the Roman period it was known by the name Eleutheropolis until it was captured by the Arabs in the seventh century CE. The Crusaders knew the ancient city as Bethgibelin or Gibelin and nineteenth century explorers referred to it with his Arabic name, Beit Jibrin. Maresha consists of an upper city and later lower city. The lower city had been built up primarily during the Hellenistic period when the upper acropolis could no longer accommodate the city’s expanding population. 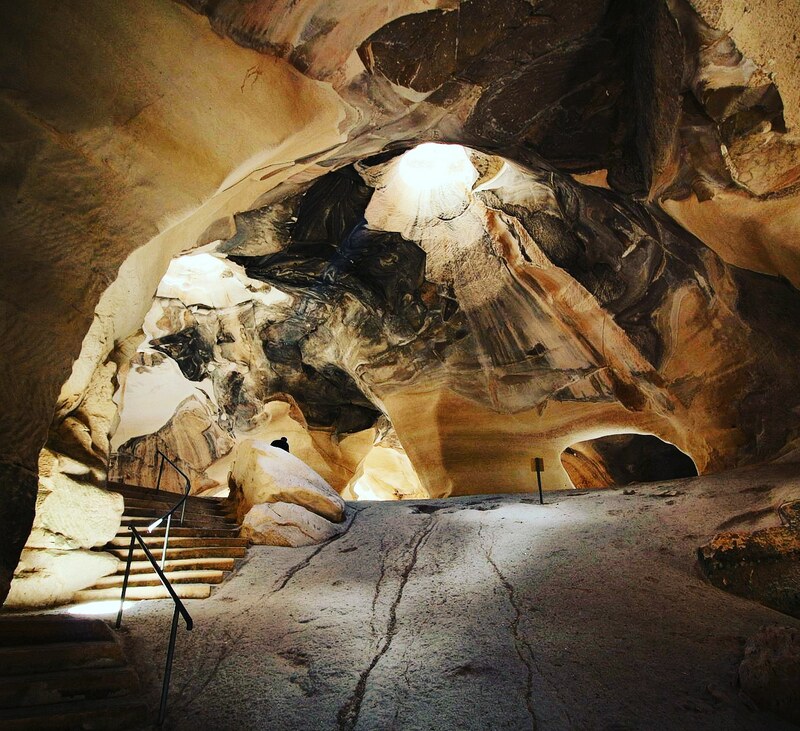 A dense complex of man-made caves and underground networks was developed beneath street level and was built in close harmony with the above two-story buildings. The underground structures were connected to the shops, workshops and dwellings that existed above the surface in the lower city. These passages could easily be accessed through entrances at the courtyards, in the alleys between the buildings, or staircases quarried through the floors of the buildings. Subterranean complexes were discovered beneath all the buildings and streets excavated on the surface. An enormous underground maze runs under Maresha’s streets with halls, chambers, winding corridors, cellars, wells and industrial installations. 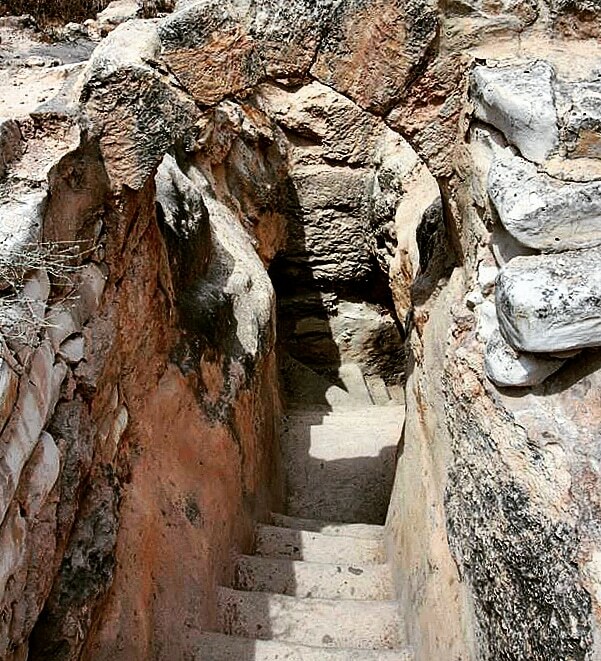 During the Hellenistic period an estimated 10,000 people lived in the ancient subterranean structures of Maresha. The archaeological remains discovered at Maresha and Bet Guvrin reflect the crossroads of influences and interchanges between the interests of Mesopotamia, Persia, Egypt, the Hellenistic world and the Roman Empire. Based on inscriptions, we encounter Idumean, Nabatean/Arab, Western Semitic, Phoenician, Judahite names and a mixture of smaller language groups. There were approximately 500 Aramaic ostraca found in Maresha, of which 400 were discovered since the year 2000. The last group ostraca, which have provenance , can provide more reliable information about the daily life of the inhabitants than the previously unprovenanced published Aramaic ostraca of the past. Three main necropolises can be found at Maresha. The tombs, dating from the third-second century BCE, reflect the cultural influence of the Phoenicians as well as the Ptolemies. The eastern necropolis is the most impressive and contains approximately 25 burial caves. 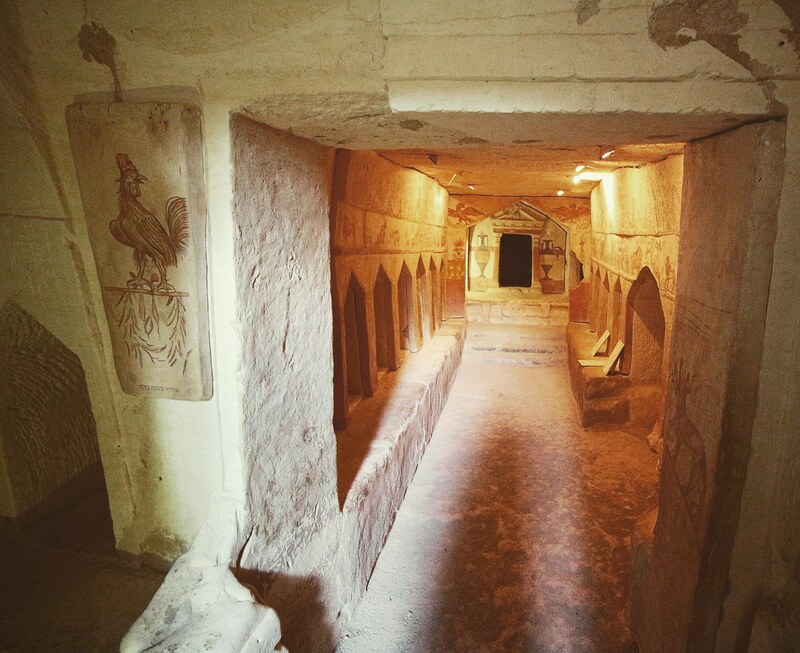 Most of the discovered tombs contain a rectangular hall with benches along the walls, with gabled niches or loculi cut into the sides of the rooms where the deceased were interred. 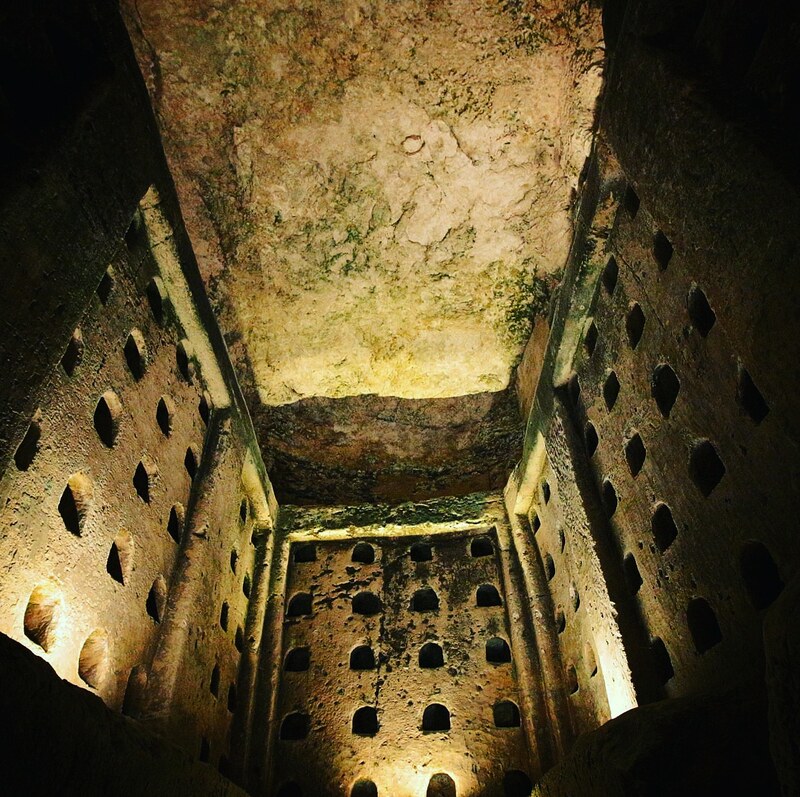 After the dead were placed inside the loculi, the niches were blocked with chalk bricks or slabs. 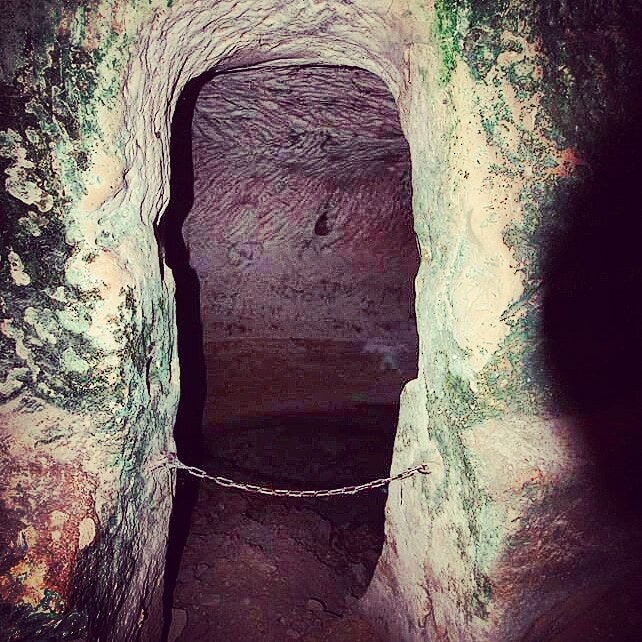 Jewish, pagan and Christian burial customs have been discovered in the cave complexes of Beit Guvrin. The “Sidonian Tomb”, also called the Apollophanes tomb, at Maresha has brilliant wall paintings accompanied with a rich collection of carved and painted inscriptions. 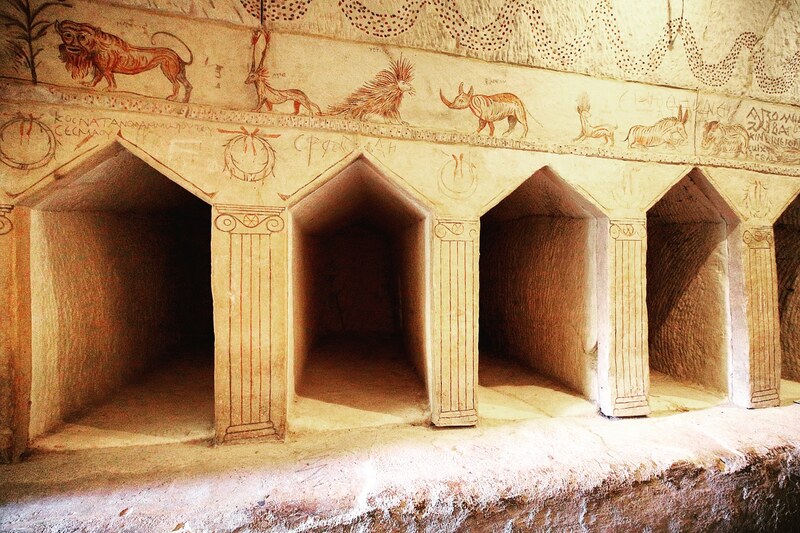 The walls of the second century BCE tomb are painted with elaborate scenes filled with animals, known as the “Animal Frieze”. 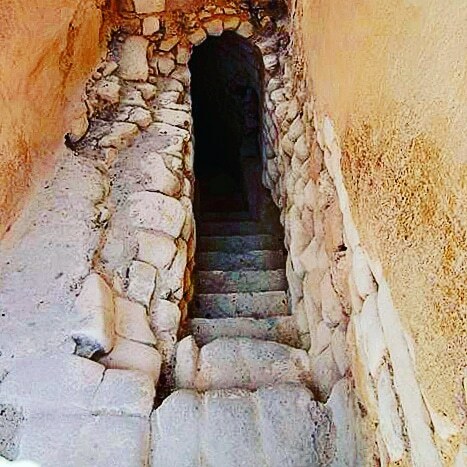 The discovery of this amazing tomb was made by villagers of Beit Jibrin at the turn of the 20th century. John P. Peters and Herman Tiersch went on expedition to Tell Sandahannah in 1902 and were led by their guide into an underground space, and there, they found themselves staring at colorful paintings of birds, a rider on a horse hunting a leopardess, a giraffe, an elephant, a rhinoceros, a crocodile with an ibis standing on his back and many many more. The inscriptions of this tomb confirm the mix of different cultural groups, religions and ethnicities that were present in Maresha. Apollophanes, bearing a Greek name, was the son of Sesmaeus, identified as a Semitic name. Another inscription in this tomb mentions the “(tomb) of Sabo, daughter of Sesmaeus.” Sabo, the sister of Apollophanes, has a name that can be assumed to be Idumean, Palmyrene or Nabataean. The following inscription mentions “Cosnatanus, son of Ammoius, son of Sesmaus”. Cosnatanus is an Idumean name but his father is named, Ammoius, which is an Egyptian name. And so, the different ethnic names continue to be named in the tomb. It is in the third century CE, that Rabbi Jonathan of Bet Guvrin remarks that the Hebrew language is most suitable for prayer, Greek most fit for song (poetry), Latin for war, and Aramaic for lamentation. The people who lived and died in Maresha and Bet Guvrin left behind a rich archaeological record of which we are just in the beginning of to understand. Specific ethnic or religious groups are very difficult to single out in the archaeological record. For now, we can say that the largest group of inhabitants were Idumeans. The offspring of the Semitic-named patriarch of the “Sidonian Tomb” had a rich cultural background living in a multi ethnic city. We must keep in mind that some of the animals depicted in the tomb were probably unfamiliar to some of the local population, as some scenes point to an African or an Egyptian source of inspiration. Above the scene of an African elephant facing a dark-skinned man, the inscription reads ‘Ethiopia’ (translation Dov Gera). Clearly the scene needed explanation to its viewers. 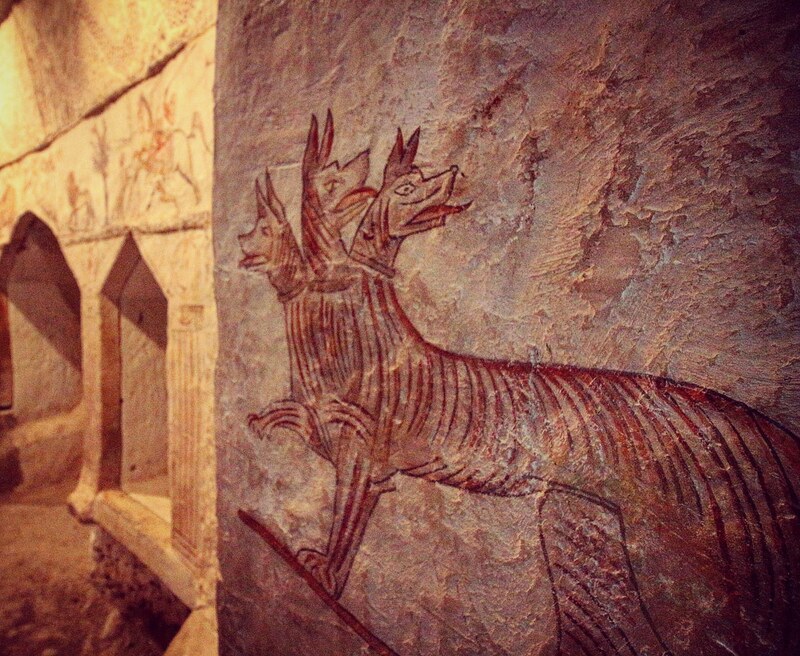 The tomb also displays Cerberus, the three-headed watchdog of the underworld in Greek mythology. He refused entrance to living humans and devoured anyone who tried to escape the kingdom of Hades. These paintings and inscriptions preserve centuries of historical memories, oral and written traditions molded into a new form. The inner layers of these stories can uncover the specific aspects of Judean life, including the social structure, religious practices and the historicity of written accounts. In this multicultural archaeological world, we have found Nabatean/Arab, Phoenician/Sidonian, Egyptian expressions, Greek koine and Judean influences, where it is very difficult to distinguish between specific groups. Perhaps this ancient society we have discovered has shown us the world upside down, just like Lewis Carroll has shown us in ‘Alice in Wonderland’. Time stands still here, and this world, perfectly logical to the ancients, stretches beyond our constructed conceptions of material culture in the archaeological record. In order to make us understand, we need to fall “down, down, down, the rabbit hole” to make more sense of this, in our current view, wildly inconsequent but at same time very sensible Underland. Where more exciting to take your children than to the Judean Plain that is also the entrance to “Wonderland“? Not all the underground structures can be seen, some fifteen key sites have been opened to the public. 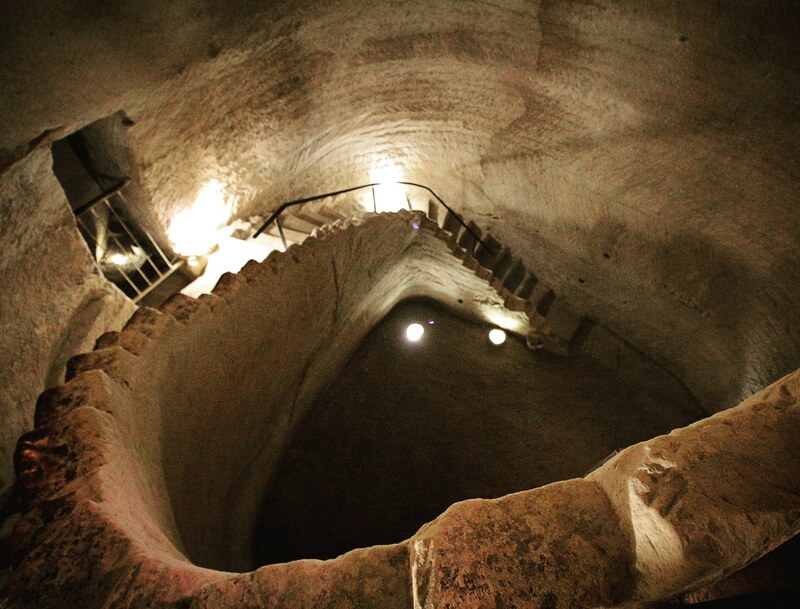 The principal ones are those known as the bell-shaped caves area, subterranean dwelling complex, the Sidonian tombs, the bath cave, the olive-press cave, the underground cistern complex and the columbarium cave. 1.Every Living Thing: daily use of animals in ancient Israel. AltaMira Press,1998. By Oded Borowski. 2. Corpus Inscriptionum Iudaeae/Palaestinae; A multi-lingual corpus of the inscriptions from Alexander to Muhammad. Part 2: 3325-3978. Ed. by Ameling, Walter,Cotton, Hannah M., Eck, Werner, Ecker, Avner, Isaac, Benjamin, Kushnir-Stein, Alla, Misgav, Haggai, Price, Jonathan, Weiß, Peter / Yardeni, Ada. 3. Excavations at Maresha were carried out by F. Bliss and R. Macalister in 1900-2.6 The lower city was excavated by A. Kloner from 1988-2000, and from 2000 until the present by I. Stern and B. Alpert. 4. Kloner, A. (2001) The Economy of Hellenistic Maresha: Inferences based on the city plan and archaeological finds, In Archibald, Z.H. et al (eds) Hellenistic Economies. London, 103-136. 5. Kloner, A. (2003) Holy Land Maresha Excavations, Jerusalem. 6. Zissu, B and Ganor, A., (2008) Survey and excavations at Horbat Burgin in the Judaean Shephelah: Burial Caves, Hiding Complexes and Installations of the Second Temple and Byzantine Periods, Report from the Israel Antiquities Authority. Bulletin 58, March 2008.7. Gideon Avni, Uzi Dahari, and Amos Kloner undertook extensive surveys and excavations at Bet Guvrin, reported in The Necropolis of Bet-Guvrin-Eleutheropolis.8. Some Dated Greek Inscriptions from Maresha by Dov Gera. In PEQ, 149,3 (2017), 201-222. Previous Post Why Did Moses Go Up on Mt. Sinai for Forty Days?